May | 2015 | This is Ashok. The net international position may not matter. Paul Krugman has a post discussing America’s net international investment position. Basically, the outputs of domestic production (i.e. 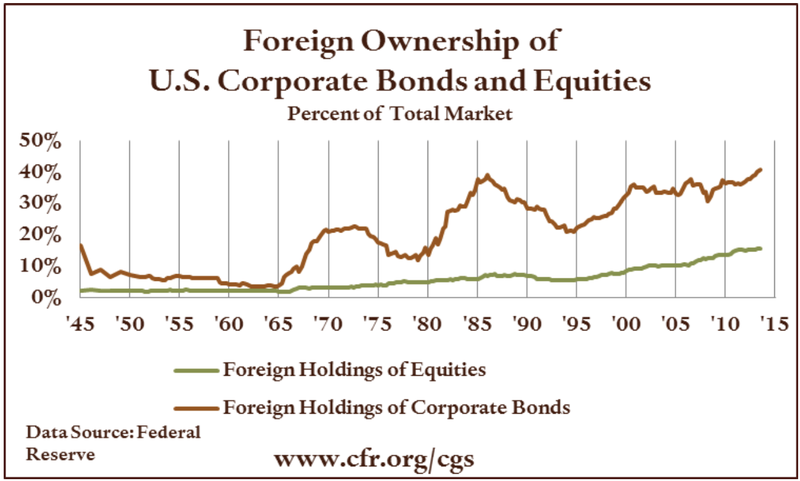 GDP) aren’t owned entirely by Americans and an increasing share of assets are owned by foreigners. The central reason for this imbalance is persistent current account deficits – when Chinese exporters recycle their dollar earnings back into the US, they earn an increasing claim to our production. So the typical reason why a country’s net investment position would deteriorate is a declining current account balance but, as Krugman points out, the US has basically cut its current account deficit in half since its peak in 2006. Therefore he suggests the superior performance of American assets might be the culprit. As far as an explanation for our net investment position is concerned, I think he’s right. But I don’t think that’s the right metric to look at. 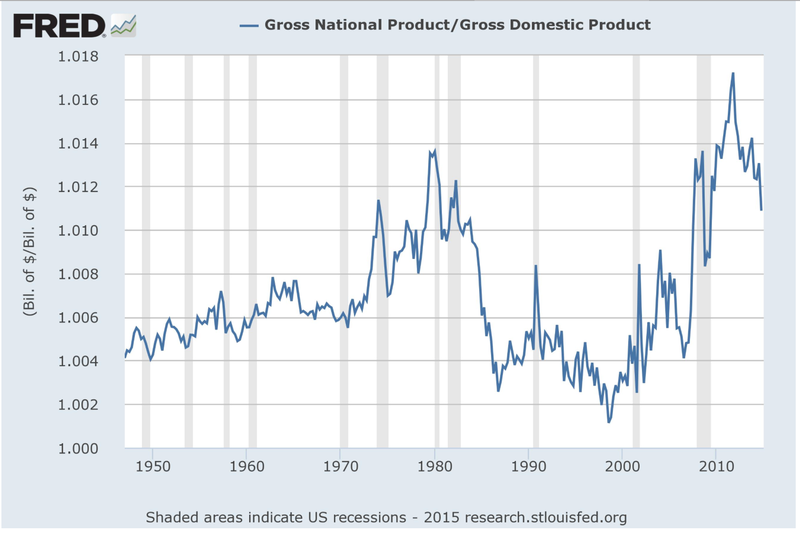 GNP has always been larger than GDP, at least in US recorded history. After a nadir in 1999 or so, this ratio has gone up (probably hand-in-hand with global saving glut-ish reasons). It’s been coming down a bit since 2012, but remains well above average. And I’ll completely admit this is a crude, but quick, way of getting to the point that the return on capital for American investors is just much, much higher than it is for foreign investors. This, by itself, doesn’t mean much. Presumably our earnings are much riskier and are hence discounted in valuation and maybe we should be worried about the net investment position after all. But here’s an interesting thought experiment. What if China committed to a new policy of recycling its trade surplus into American gold, which has no nominal return whatsoever. What if, with the financing provided by selling that gold, Americans invested in riskier international companies and corporate paper. Then, in a world where emerging markets perform much worse than the US – in fact, in a world where emerging markets consistently produce negative returns on capital – our investments are rotten. But in pretty much every conceivable world – i.e. a world where technology diffuses from rich countries to poor countries – the US investment will have a better holding-period return. And, nowadays, Treasuries are kind of like gold. In fact, that’s why growth theorists might be a little puzzled by this turn of events. Capital is supposed to flow from rich countries to poor countries to finance development abroad, just like water should roll down a hill. Clearly that doesn’t square with the incredible amounts of cheap cash flowing into America, and the safe-asset squeeze (whether something that’s an actual market reality, or something that is an artifact of mercantilist/crisis-weary state policy) has a lot to do with it. This still doesn’t explain valuations, however, unless we adjust for the fact that US and foreign investors have very different risk profiles. 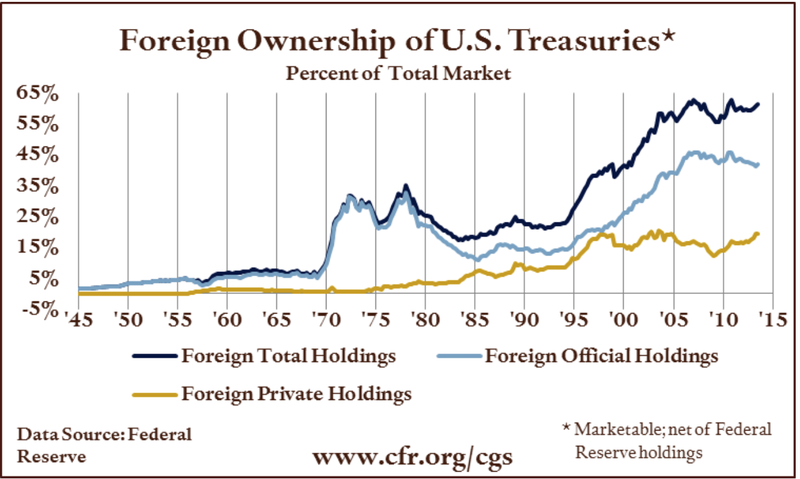 Foreign investors (see the first chart) are largely official, and have a single-minded interest in preventing the 1999 sort of debacle where a shortage of dollars resulted in currency havoc and financial crisis. American investors are almost exclusively private corporations that don’t have a shortage of dollar-assets, that almost never borrow in a foreign currency, and live in a world of really, really cheap basis trades. So private, social, and market valuations diverge. In some cases, that doesn’t matter. If foreigners suddenly called all their assets and stopped rolling over our debt, it would be a disaster (and we certainly couldn’t fund our liabilities with our foreign assets alone). But that doesn’t matter – the whole premise of the safe asset squeeze is this scenario is highly improbable (otherwise valuations would not have – could not have – been what they are). The more simple description of the entire argument is that US treasuries provide a liquidity service to foreign governments and there is an inefficient shortage thereof. Or, even simpler, the US is a classical bank earning a profit on the spread between its borrowing and lending rates. Sometimes returns paint a more useful picture than valuations.